Think of an open field...What does it look like? Now picture a cube in this open field...what does its surface look like? What is the cube made out of? Ok now picture a ladder in the scene...Where is it in relation to the cube? Ok now picture a horse in the scene...what is the horse doing? You were a sensitive baby. You didn't like change and you would get upset over small noises or sudden movements. You ere a slightly disconnected, slightly distant baby. Your parents didn't hold you as much as they should have. You felt generally threatened by your surroundings in the beginning phase of your life. You were loud and proud. If something was wrong, you let the whole world know. You would giggle, hum and of course cry. You welcomed attention from your parents and made sure every one knew you were there. Have you ever wondered how you acted as a baby? Your parents may have told you some stories, but only this test will be able to tell you for sure. 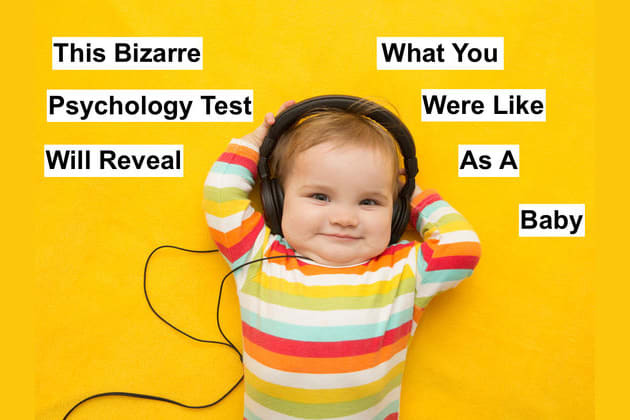 Take this quiz to find out what we were really like as a wee tike.